Adapatable, manageable, easy to grow and visually stunning - this is a beech tree that is really garden worthy! Perfect as a hedging or specimen plant, Fagus sylvatica 'Atropunicea' is a purple beech which will certainly stand out from the normal greens in your garden. With gorgeous year-round interest, the deep purple leaves of this beech tree retain their colour throughout the year before turning crisp and brown in the winter - staying on the tree until new leaves star tto emerge in the spring. A fast growing and easy to maintain deciduous tree, Beech is extremely adaptable, being easily clipped into a hedge, forming a dense screen to protect your privacy. As well as creating a border or feature in your garden, beech is also great for the environment and a haven for wildlife, providing shelter and food for many animals. Supplied as an established plant 60-80cm including 3L pot, Beech will ultimately reach 25 - 30m, but is so easy to keep small by pruning that it can be grown in most gardens. A fast growing and easy to maintain deciduous tree, beech has many structural uses in the garden, where its striking colour makes it an interesting ornamental hedge as well as a stunning specimen plant. When grown as a hedge, Beech is extremely adaptable, being easily clipped into a desired shape, plus it has the added advantage that it retains its leaves over winter forming a dense screen to protect your privacy. Such is its popularity, beech is frequently used in garden design and was a particular favourite of the garden designer Capability Brown in his landscape designs. Best grown in full sun, preferring a rich, well-drained soil - although it's quite tolerant of most soils except waterlogged areas. If you’re planting in spring or summer, water well and regularly for the first few months. Beech trees do not require regular pruning, just a quick once over to remove any dead, diseased or damaged branches in the winter. 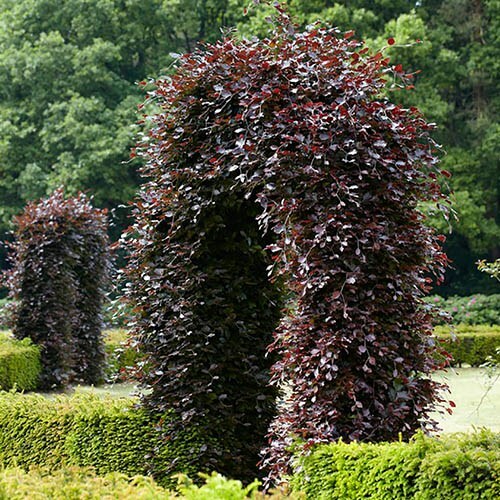 If growing as a hedge, remove the top of the plant when the desired height is reached and clip twice a year.